High speed cutting disc producing fewer sparks and reduced burr formation. 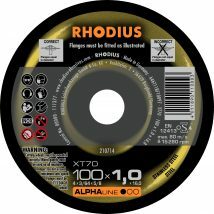 The Rhodius 180mm Cutting Disc XTK70 is a reliable cutting disc operating at high cutting speeds producing fewer sparks and reducing burr formation. 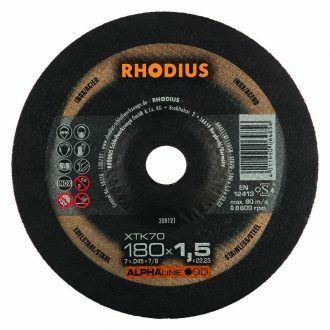 The Rhodius 180mm Cutting Disc XTK70 is suitable for use on steel and stainless steel applications. Ideal for low-power machines. The Rhodius 180mm Cutting Disc XTK70 is part of the ALPHAline series. ALPHAline products are reliable grinding tools with an attractive price-performance ratio for the price-conscious expert.